Who in our voice-acting community doesn’t know and like Joe Cipriano?! His affable demeanor is one cultivated over the years in a storied broadcast and voiceover career. When you get to Joe’s level of professionalism and tenure, it’s normal to look back and marvel at the circumstances and the serendipity that got you there. Joe took that look back, and decided it was worth a book. 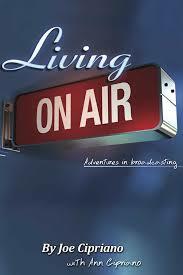 Late last year, that book came out, and I gave it one of the first public reviews right here on this blog: Joe Cipriano: Living on Air. Now, Joe is visiting a lot of his former haunts, and some major metro areas to premiere his book. Luckily one of his stops is going to be here in Las Vegas this upcoming weekend, January 18, 2014. Coincidentally, well-respected VO Coach and producer Marice Tobias is holding a workshop that same weekend, and will be joining Joe for a Q&A after Joe conducts a live audiobook reading from his book at the coming-out party. We’re hoping to give Joe a robust welcome to our Vegas Voice-Over community. If there’s any chance you can come, please let us know. Follow this link to see the official invitation. ‘Hope to see you there!